News outlets were still processing a pair of fatal shootings by police and the ensuing protests on Thursday night when more gunshots rang out. This time it was in Dallas, and police officers were the targets rather than the shooters. The news broke at a time when much of the American press was focused on the demonstrations that had sprung up across the country -- from New York to Minnesota to Texas -- in protest of the officer-involved shootings in which two black men were killed this week. Below is a timeline chronicling the media's response to the Dallas ambush, in which five officers were killed and seven other people, including two civilians, were wounded. It will be updated throughout the day on Friday to add more of the notable moments in coverage from Thursday night and Friday morning, and to include ongoing developments. Michael Kevin Bautista started streaming live on Facebook when he heard gunshots one block away. He zoomed in with his cameraphone and saw officers on the ground. Local TV stations in Dallas were also live when the shots rang out. Fox News was showing one of the local live shots when a crowd of protesters suddenly started running away from the KDFW crew. The cameraman ran toward the commotion and zoomed in on multiple officers who were face-down on the street. Fox host Megyn Kelly interrupted the debate that her guests were having. "This is disturbing," she said. "I'm not sure what we're seeing, but it looks from this vantage point like an officer down." There were periods of silence. Kelly hesitated, wary of speculating, but unable to ignore what she was seeing on the screen. "That officer is not moving." The control room cut away to peaceful protests in Times Square. "This is the state of America today," Kelly said, noting the contrast. One of the first social media posts to go "viral" and inform users of the carnage in Dallas came from Twitter user @allisongriz. The tweet was accompanied by a 45-second video of the shooting. "There's people laying on the ground," a woman can be heard saying in the video. "I hope they're just hiding." @allisongriz needed only a fraction of Twitter's allotted 140 characters to capture her emotions at that moment. "I am so scared," she said in the tweet, which was retweeted 75,000 times and liked almost 70,000 times by midday Friday. G.J. McCarthy, a photojournalist for the Dallas Morning News, was at the protest when shots were fired. McCarthy shared a frenetic video from the scene in which gun shots can be heard. MSNBC had spent most of the night discussing the police shootings this week that left black men in Louisiana and Minnesota dead. Nearly half past 10:00 p.m. ET, host Lawrence O'Donnell was interviewing Janai Nelson of the NAACP Legal Defense and Educational Fund when he shifted his focus to the events in Texas. "We're going to have to go to breaking news in Dallas, where there are reports of shots fired after a demonstration there over the deadly officer-involved shootings in Louisiana and Minnesota," O'Donnell said. "Witnesses have said one Dallas police officer may have been shot." O'Donnell turned to MSNBC anchor Milissa Rehberger for more details; at that point, Rehberger was leaning on social media like so many others. "I'm just reading things off of Twitter right now," she said. "But apparently, according to a lot of people on Twitter, several shots were fired, again, unconfirmed, that at least two police officers may have been shot." All the cable news channels showed police -- some in tactical gear -- swarming the scene. Information was murky in the immediate aftermath of the shooting, as outlets scrambled to confirm how many gunmen were involved and how many officers were hit. A little past 11 p.m. 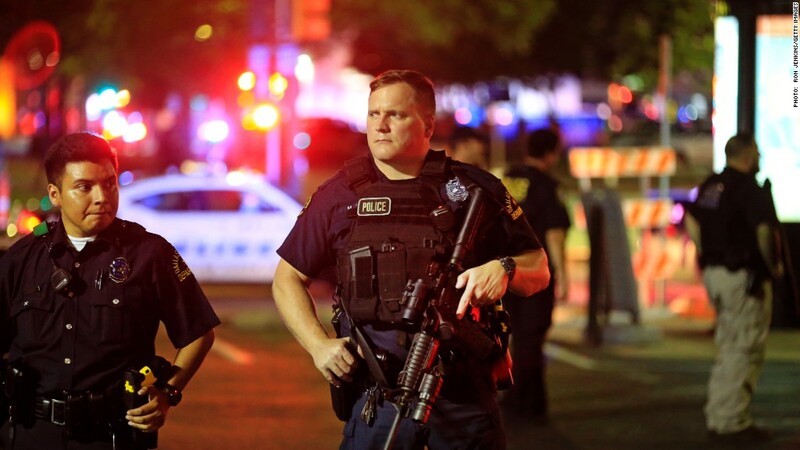 ET, Dallas Morning News reporter Caleb Downs had confirmed that two officers were down. Around that same time, Downs reported that one shooter was in custody, with "at least one more on the loose." Sgt. Nathan Swyers verified at least two officers down. One is in Parkland, the other is in Baylor. Statuses unknown. Swyers also said one shooter is in custody and there's at least one more on the loose. Swyers said their trying to locate the suspect now. The Dallas police chief announced that "three officers are deceased" -- the first official confirmation of deaths. On KDFW, one of the local anchors noted that the officers "who were protecting the people protesting lost their lives by a sniper." "Not even man enough to stand face-to-face with them," the anchor said, his voice quivering slightly. The Dallas Police Department tweeted a photo of a man who had been identified as one of the suspects, urging the community to help find him. Moments later, reports began to emerge that the manhunt had culminated with Dallas police cornering and negotiating with the suspect. Chief Brown says Dallas cops have cornered, are negotiating with alleged shooter. Many of those same reports contained another distressing detail: that the gunman claimed to have planted bombs throughout downtown Dallas. The news was still unfolding, but The Drudge Report had already settled on its narrative. 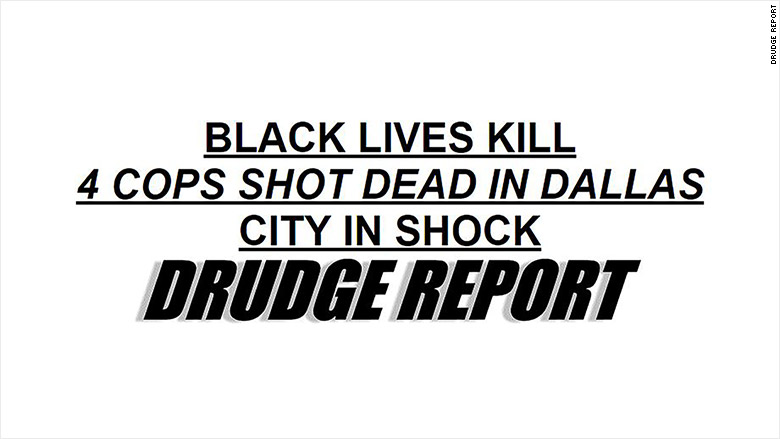 "BLACK LIVES KILL," a banner headline on its site declared. Not an hour after the police asked for help finding the man they'd identified as a suspect, a Twitter user, @AmairanyMedel, posted a video that was one of the first signs the police and the media had the wrong guy. The Twitter user insisted the man was innocent, and had been marching behind her the entire time. Brian Williams began anchoring on MSNBC. He called the situation a "national emergency." His presence was welcomed by some viewers but criticized by others. He remained on the air until 4 a.m. ET. Williams, who has rarely appeared on NBC in the year since he was fired from "NBC Nightly News," anchored a special report on the network. On Twitter, some media critics lambasted NBC and the other broadcast networks for not carrying extensive live coverage of the attack. Sports Illustrated media columnist Richard Deitsch tweeted, "It's insulting and infuriating." CBS noted that it was live all night through CBSN, its relatively new streaming news channel. The breaking news forced the New York Daily News to scrap its original front page in order to give top billing to the Dallas shooting. "MADNESS," read the headline in the Daily News, which has become one of the leading media advocates for gun control. About an hour later, its rival tabloid, the New York Post, unveiled its own front page, adorned with a characteristically divisive headline: "CIVIL WAR." Around the same time, the Dallas Morning News published its own Friday front page, with a massive, all-caps headline befitting the story's gravity. As facts came more clearly into focus, reporters suddenly had a different story to tackle: the man Dallas police had identified as a suspect, and who ultimately surrendered to authorities, was innocent. The man told CBS Dallas that he wasn't even aware that his image had been disseminated by authorities. He called it a "persecution," and said he wouldn't be satisfied with simply an apology from the police. "I don't know what to say. I can't believe it, I can't believe it...In hindsight, 20-20, I could have easily been shot," he said. CNN's Don Lemon, who had begun anchoring at 10 p.m., signed off after four hours. He showed the "AMBUSH" headline and said, "What a day it was. We went to bed with the shooting in Baton Rouge... We woke up with the shooting in Minneapolis, Minnesota. All caught live, you know, on tape. And then we end the day and begin the morning with this." "We just lost another," came the message from the Twitter account of a union for Dallas police. "Officer Down." The Dallas Morning News cited that tweet in reporting that a fifth officer had been killed. The Dallas Morning News reported that a gunman had been killed in a garage, bringing the long standoff to an end. CNN correspondent Sara Sidner appeared live on the network from the scene of the standoff, having arrived with colleagues in Dallas roughly an hour earlier. They had traveled to Chicago the previous day to cover protests of this week's officer-involved shootings when news of what was happening in Dallas broke. In her first on-the-ground report, Sidner described the scene as "calm" relative to the chaotic events of the previous few hours. Sidner reported live roughly once an hour for the duration of the morning. American reporters who had followed President Obama to Poland for the NATO summit suddenly had a domestic story to cover. While most Americans were still sleeping, Obama addressed the shooting. "We still don't know all the facts," Obama said. "What we do know is that there has been a vicious, calculated and despicable attack on law enforcement." CNN White House correspondent Michelle Kosinski reported live from Warsaw all morning, noting that Obama had addressed the fatal police shootings in Louisiana and Minnesota when he arrived for the summit this week. "So early this morning, first thing, he wanted to speak again," Kosinski reported. Reporters gathered in Dallas for a press conference held by Dallas Mayor Mike Rawlings and the city's police chief, David Brown. CNN, MSNBC and Fox News all cut live to the presser, during which Brown plead with the community to end the schism between police and civilians. Brown also provided some details about the dead suspect's motives. "The suspect said he was upset about Black Lives Matter," he said. "He said he was upset about the recent police shootings. The suspect said he was upset at white people. The suspect stated he wanted to kill white people, especially white officers." 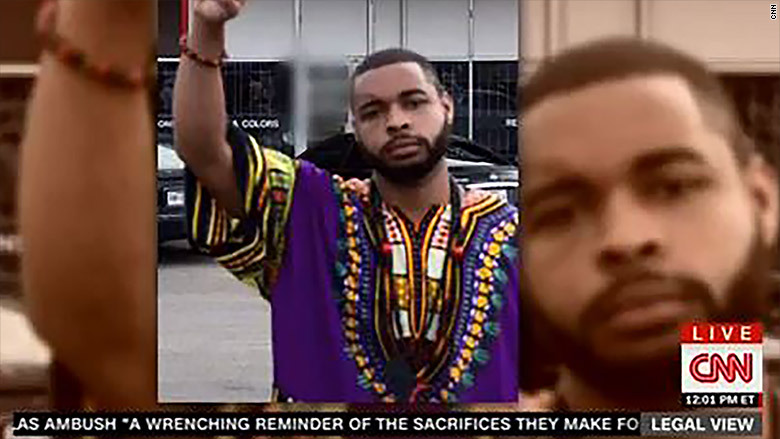 Media outlets begin identifying the dead gunman as 25-year-old Micah Xavier Johnson. With the suspect having been named, reporters raced to find any details about his life or clues to his possible motive that might be available online. The most prominent detail to emerge was a photo from Johnson's Facebook account. The photo, showing Johnson raising his right fist, was shown repeatedly on cable news Friday afternoon. "We have also been told by those who live near him that this is, in fact, him," CNN anchor Ashleigh Banfield said on-air as the photo appeared on screen. "But the details about him, and his life, are sketchy and they are rare, as well, to find." Banfield and other reporters were able to relay a smattering of information about Johnson: he lived with his mother, he was a veteran who had been deployed to Afghanistan and he had no criminal record or known terror ties. CNN and other outlets reported, citing federal law enforcement officials, that Johnson acted alone, countering reports throughout the night that there had been multiple shooters. ABC announced that it would air special coverage of the shooting on Friday night under the dramatic headline: "America In Crisis: Ambush In Dallas." The network said that David Muir would anchor its evening news coverage from Dallas on Friday, while a special edition of 20/20 would air later in the evening. Shortly after ABC's announcement, CBS said it would be doing special coverage as well. Its one-hour special, called "48 Hours: Bringing A Nation Together," will air Saturday night, and will feature on the ground reporting from CBS correspondents.